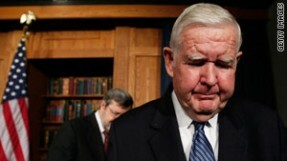 Rep. John Murtha of Pennsylvania, a longtime fixture on the House subcommittee that oversees Pentagon spending, died after complications from gallbladder surgery, according to his office. He was 77. The Democratic congressman recently underwent scheduled laparoscopic surgery at National Naval Medical Center in Bethesda, Maryland, to remove his gallbladder. The procedure was “routine minimally invasive surgery,” but doctors “hit his intestines,” a source close to the late congressman told CNN. OMG I HAD THAT SAME OPERATION I COULD HAVE DIED!!! On a lighter note, how ironic is it that the president loses a pro-ObamaCare vote due to medical error in a government-run hospital?